We recently discovered the treasurers that can be found in Alabaré Emporiums and we want to encourage our members to help and support these enterprises. The charity behind the Emporiums, Alabaré, is a leading provider in the supported housing sector, helping people who are homeless including Veterans and young people. In addition, they offer long-term homes to people with Learning Difficulties. All the funds raised through the Emporiums go towards supporting Alabaré’s fantastic work. We hope to help this charity can expand these ventures in the coming years. In particular we want to support new developments in the Amesbury and Gosport areas. Have you any goods you can donate to the Emporiums? Could you spare a few hours to work at one? Can you help promote them through your Social Media? Looking for something more adventurous to offer help with? President Janice has already committed herself, it would be great to have a team from the Rotary Social Innovation involved…. 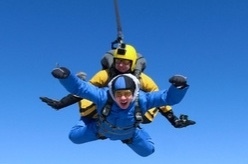 President Janice has agreed to take part in Alabaré’s Skydive and hurling herself out of a plane 10,000 feet above the ground – now that’s dedication to helping a good cause. Alabaré are running this ultimate challenge event, to coincide with the 100th anniversary celebrations to mark the end of World War One. We are offering brave fundraisers the chance to be one of the incredible 100 jumpers who the charity are hoping will take part on this fantastic day! By taking part, you will be raising funds to help Alabaré continue their work of supporting homeless and vulnerable Veterans. Alabaré’s Homes for Veterans is the largest provider of accommodation for working age homeless Veterans outside of London. If you are interested in getting involved, either by taking part or by helping to support the event by getting sponsors, please visit the Alabaré website to find out more.